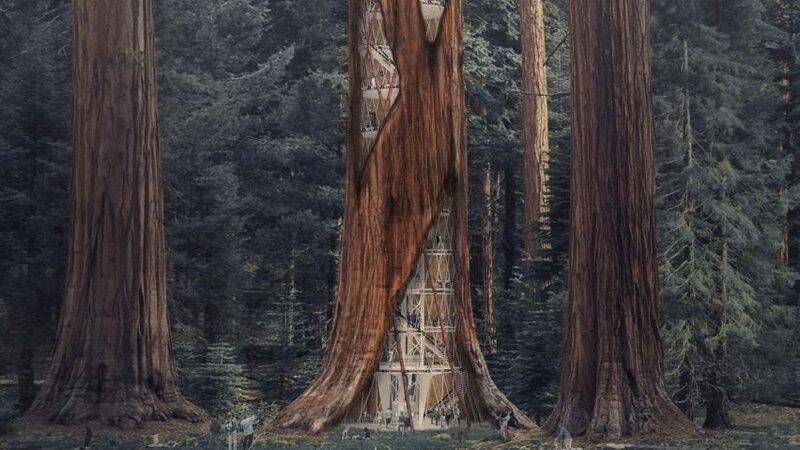 A conceptual scheme by a team of South Korean designers calls for inserting towers within the hollowed-out trunks of giant sequoias in the western US. Called Tribute: The Monument of Giant, the visionary scheme imagines buildings constructed within the empty trunks of giant sequoias, a type of redwood tree native to the Sierra Nevada mountains in California. The structures would be placed where heartwood has rotted away, preventing the huge ancient trees from falling. Giant sequoias are the largest single trees in the world, with average heights of 50 to 85 metres and diameters of six to eight metres. They also are among the oldest living organisms on earth, with certain trees believed to be over 3,000 years old. received honourable mention in the 2017 eVolo skyscraper competition. "This project attempts to show a new architectural approach to human coexistence with nature, in harmony with the nature's temporality," the team said. "The architecture quietly takes place in the empty void of trunks, without hindering the breathtaking landscape formed by the giants. It then becomes active as an artificial organ to replace the trunks rotten away." Inside the trees, a structural core would run up the centre and an additional lattice-like cage would form an outer casing behind the thick bark. A series of platforms would provide spaces for education, laboratories, exhibitions and observation decks. Water would be drawn up from the ground using a system that mirrors the tree's natural collection method. The conceptual design is meant to serve as an antidote to the worsening condition of the environment. Human's plundering of the earth's resources has led to a rise in natural disasters, the team said. "The desire of human has been endless and it is incapable of coexisting with the nature," the team said. "Crying in agony, the nature seems to fight back with natural disasters all around the world, and it is increasingly visible that the earth is ever more sickened." The team described deforestation as "one of the most deadly sins to nature", and also a leading cause of natural disasters. "Now is the time that we need to change, to stop exploiting the nature for selfishness and to start learning how to supplement each other on living," the designers said. Giant sequoias were chosen not only for their height and volume, but also because their root system is relatively shallow — meaning that when they start to rot, they can easily fall down. "When the heartwood – the structural backbone of the tree – starts to rot, the trees fall dead from their own weight," the team said. Constructing buildings within the trunks would enable the trees to continue standing. "Only occupied in the void is the minimal gesture necessary for the human stay," the team said. "It complements the structural reinforcement and features, not only for the humans but for the giants to stand." The giant sequoias are being "mercilessly destroyed" by modernisation, the team said. Global warming has increased the breeding rates of insects that inhabit and kill trees. While giant sequoias have not yet been affected, climate-induced pathogens have killed spruce and pine trees in western North America, according to Yale's forestry school. The designers hope their proposal will bring attention to the plight of the trees, and will inspire in people an appreciation and respect for nature. The scheme was among 22 honourable mention in this year's eVolo skyscraper competition, which invites architects and designers to conceive futuristic towers. The first-place winner was a modular farm tower proposed for sites across sub-Saharan Africa, by Polish designers Pawel Lipiński and Mateusz Frankowski.